a little chicken « AFTER THE POP ! when i was about 18 years old i saw a film about the mass production of meat in america. in it, there was a film of a large chicken warehouse with the chicken coops stacked on top of each other and crowded in this huge space like an overcrowded prison. i also remember a small box that baby calves were kept in the dark with no ability to move to keep their muscles from forming. i became a vegetarian for awhile after this. mind you, this was in 1981 or so. i became macrobiotic for a short while after that, working too hard to follow the teachings of george and michio kuchi by eating seasonal and local vegetables, no red meat or fowl, and only seafood on occasions. this menu included lots of salt and lots of pickled foods. pickled daikon radish, umeboshi plums, over baked plum seeds that became ashes, and baked carrots that were meant to be sweets. this particular diet was challenging. as you can imagine, hardly any of my peers practiced this dietary principle and it was excruciating to eat out or go to friends for dinner. 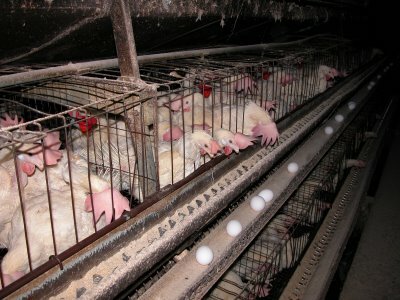 for me, however, the image of those cages stacked on top of each other so close they could be pigeons hiding from the rain, shitting on one another, unable to move, being fed vitamins and being pumped full of steroids stuck with me. still does for that matter. i stopped eating chicken right after that meal. it makes my flesh crawl to think of even putting that meat in my mouth. turkey, duck, and quail don’t affect me this way, but i don’t eat them often either (turkey once or twice a year, duck and quail- never). so t-day is just a few away and i am getting a little foggy about these boundaries again. we have purchased a free range, additive free bird from a local farm. it is small, and it will no doubt be more a tradition than a necessity. i will eat the veggies and the cranberry sauce more than i will eat the national meal. and that’s just fine with me. this clip really has nothing to do with this post. i am just feeling a bit melancholy and jane oliver takes me back to a time when hope was bursting at the seams. something to soothe my soul after looking at those pasty dried chunks of flesh today. This entry was posted in free range chicken, processed foods, turkey.